Greenwich Academy’s annual Winter Warmer offers an occasion for parents in the community to come together and hear from an expert in a field that relates to parenting or education. This year’s experts were none other than our own GA girls. 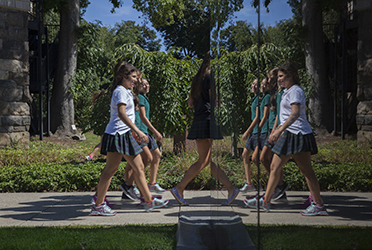 Five Upper School girls discussed their research through Center for the Study of Boys’ and Girls’ Lives at the University of Pennsylvania’s Graduate School of Education. The girls shared their findings and perspectives on the role of temperament (introversion and extroversion) in the classroom environment. A year ago, the girls’ faculty advisor Meryl French posed the question: If you could change one thing about GA what would it be? A common response was report cards. Digging a little deeper, many students reported receiving comments such as, “I wish you would participate in class more,” and felt that their need to reflect on class discussion was being interpreted as a lack of engagement. Connecting this issue to the role of temperament in the classroom, the girls zeroed in on this topic as the focus of their research. The girls began their work, surveying teachers on the qualities of an ideal student, without telling them exactly what they were researching. They found that English, history and language teachers expressed a preference for students who actively participate in class, whereas math and science teachers were less focused on class participation as a characteristic of the ideal student. In their presentation at the Winter Warmer, the students discussed other details of their research, coming to better understand how their own introvert/extrovert tendencies impact their interactions inside and outside the classroom, and how introverts and extroverts are perceived in Western cultures versus, for examples, Asian cultures. It was also the girls’ research that led to the selection of the summer 2013 faculty read, Susan Cain’s Quiet: the Power of Introverts in a World That Can’t Stop Talking. During the Q&A portion of the presentation, parents were eager to “ask the experts,” about everything from the role of gender in classroom behavior, to whether or not extroverts ever feel pressured to be more introverted. The discussions on temperament then continued in breakout groups, with both students and teachers acting as facilitators. 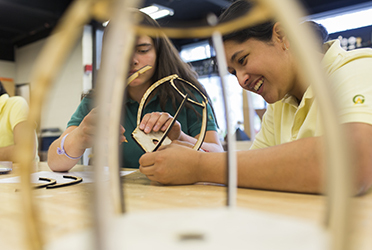 While it is typically the role of the teacher to challenge students to expand their thinking, through their research and efforts to educate the broader community, the GA girls are challenging their teachers to reconsider and adjust their approach to student interaction.